The Boston Americans were no strangers to postseason play, but 1915 marked the Phillies' first-ever National League title. The Phils were led by power hitter Gavy Cravath, slick-fielding shortstop Dave Bancroft and ace pitcher Grover Cleveland Alexander, better known as "Pete." Alexander gave his Phils the edge in Game 1, besting Sox starter Ernie Shore with a 3-1 victory. It was 1-1 until the bottom of the eighth, when the Phillies manufactured a pair of runs to provide the final margin. Game 2 matched Boston's Rube Foster, who led the club with 20 regular-season victories, against Erskine Mayer. Foster allowed just three hits while Mayer permitted 10, yet the score was 1-1 after eight frames. In the top of the ninth, Foster himself drove home Larry Gardner with an RBI single. And in the bottom of the ninth, Foster retired the Phillies in order to seal the 2-1 victory and even the World Series at one game apiece. The World Series moved to Boston for Game 3, but the result was the same as Game 2, with the Sox winning 2-1 in their last at-bat. Alexander and Dutch Leonard battled to a 1-1 standoff until the bottom of the ninth, when Duffy Lewis singled over second base, sending Harry Hooper home with the winning run. And it was more of the same in Game 4, with Boston posting its third straight 2-1 decision. Ernie Shore earned the decision, scattering seven hits and four walks. Back in Philly for Game 5, the Phillies owned a 4-2 lead after seven innings, thanks largely to Fred Luderus' three RBIs. But in the top of the eighth, Lewis tied the game with a two-run homer into the center-field bleachers. And with one out in the ninth, Hooper walloped his second solo shot of the game, and the Sox were on top, 5-4. That's how it ended, as Rube Foster disposed of the Phillies in the bottom of the ninth, 1-2-3, to clinch the World Series for Boston. 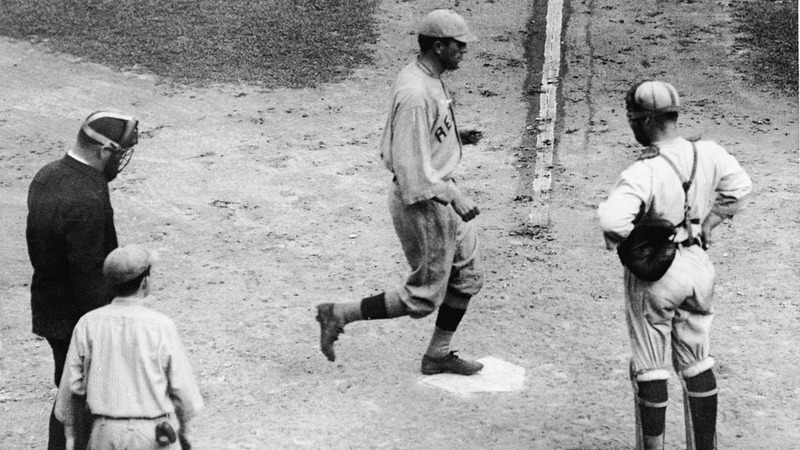 A young Red Sox pitcher named Babe Ruth made just one appearance in the Series, as a pinch-hitter in Game 1. Of course, Ruth would eventually make his presence known in many World Series, as both a pitcher and a hitter.